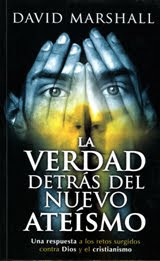 My atheism book is now out in Spanish! For those who do your shopping in Walmarts in Mexico, you're in luck! Unilit, a popular Spanish publishing house based in Miami, has just translated and published my last book, The Truth Behind the New Atheism. Better than half of their audience is in Latin America or Europe. Who would you like to see read this book in the Spanish-speaking world? Now that Fidel Castro has retired, maybe he has time to do some reading? Or perhaps Abimael Guzman, founder of Sendero Luminoso, the Maoist organization in Peru infamous for hanging dogs and terrorizin peasants, now sitting in a naval jail cell near Lima, might rethink some of the philosophical errors that took him down that dark path? I may do some speaking the southern US, or further south, to help sell the book. I'm also beginning to edit chapters coming in from Christian scholars for my next project, Faith Seeking Understanding. Why did you have to censor my comment? Just because you don't have to guts to defend your work doesn't mean you have to silence critics. Evil: Read the guidelines before you post. And in general, don't expect me to post vacuous criticism: if you're going to criticize, make it substantive. This is not a garbage dump. It’s strange that you accuse me of “vacuous criticism” when all I did was mention a link to a review of your book that contains valid criticism and gave my truthful opinion about the contents of your book. It seems to me that you’re the one who needs to post substantial arguments and quit avoiding directly answering your critics. Since you ask for more substance I'll give you some. Since I've read quotes from your book from the review and I haven't read your book directly what is your best argument against Richard Dawkins and the new atheists? Let's see what you got. What you did, was use vile language, which my guidelines specifically exclude, scoff vaguely, and say nothing of substance to back up your scoffing. I'm not going to spoon-feed my books to someone who's acting like a fool, or even to someone who's not. If you don't know what you're talking about, and can't be reasonably courteous, then don't talk! C’mon Dave, when are you going to defend your work? I’ve asked you how many times now? Maybe those guys at Debunking Christianity are right. You are all talk. I hate to break it to you but you are the only one who is acting a fool. Defend your work already and maybe people will take you seriously for a change. If not then you’re only hurting yourself. Just to show people how bad your book is I’m going to post that review in as many places as I can. It should be read by anyone who wants to know the actual truth about you and the new atheism. Take it easy Dave. Don’t hurt yourself trying to come up with any more stunning rebuttals. If you did use foul language that was clearly inappropriate and your comment was not censored. It was moderated in tune with the author’s comment policy. I am happy to see that you gave more substantial criticism the second time around even if it was just a link. The linked webpage was interesting and seemed very informative. I agree with you about Evil’s behavior but I do not understand your unwillingness to discuss criticism of your book either here or on Debunking Christianity. Why won’t you respond? While I disagree with Evil’s approach I do agree that you should offer a response, especially since the criticism certainly seems thoughtful, well done, and does seem to refute many of your arguments. Tommy: I actually did delete Evil's first (short) post, so he can fairly call that censorship, if he likes. So if it's Ken's arguments that you're talking about -- please, be my guest! Give me the two or three that you find most effective, and I'll be happy to respond. If I find any of those represent my arguments accurately, and deal with them reasonably, I may have to take a closer look at the latest version of Ken's argument directly, and give a longer response. I am baffled by your request. Generally when someone is made aware that their arguments have been dealt with that person goes to read that website, article, or book to see first hand what has been said. Why do you want me to do your work for you? Because I haven’t read your book I don’t think I’d be the best person to judge what is the best response to your arguments. I am not perfectly clear about what has transpired between you and this person Ken but the blog I looked at was called Arizona Atheist. Az Atheist also pointed out how you’d lied about him and insulted him which lead him to lose his temper towards you. If this is the case then I don’t see why you should be holding a grudge. He was responding to your behavior, not the other way around. From what I read at Debunking Christianity he also seems upset over the fact that you never offered an apology when he wrote you to apologize despite the fact that you began this flame war, at least according to his version of events. That seems like too much mess for me to sort out so I’ll just leave you with this request. Why not do your own work, read his blog, and respond? All i asked was that you take a look at this well written review. I said clearly the reason why. I haven’t read your book yet and wouldn’t be the best judge as to the accuracy of the arguments and counter arguments. At this, you respond with an obvious attitude and I don’t appreciate it. You say you don’t want to waste your time going over non scholarly critiques of your book but so what if Az Atheist isn’t a scholar [whatever that means]? That doesn’t automatically disqualify him from giving an informed opinion. You yourself said that it doesn’t matter what someone’s qualifications are as long as their arguments have merit. They have a word for this kind of thing: hypocrisy. Tommy: You accuse me of lying, then complain that I respond with "attitude?" Yes, I think the word for that is "hypocricy." If you have the nerve to go on someone's blog and accuse them (without any evidence) of lying, then a little "attitude" is the least that you have coming in return. No one forced Avalos to debate me. His silly ad hominens aside, I am, in most important respects, his peer. But having chosen to debate me, it was up to him not to show that I am an incompetent scholar (as he attempted, as he always attempts), but that I am wrong in my main contentions, and that his arguments in The Christian Delusion were right. I have NOT chosen to debate Ken, except in a few short exchanges, mainly I think on Amazon. Can you show any such exchange, in which I fail to address the main substance of Ken's argument? If you can do so, I will be happy to address it here and now. But I don't think you will be able to do so. So you (and probably Ken) are confusing two things: (1) whether a scholar should debate an opponent he doesn't respect in the first place, and (2) having chosen to debate, whether his arguments should be mainly ad hominem or mainly address important substance. I did not, BTW, block your post: I've had some trouble with the software. I'm sorry for the difficulty you had in posting. I’m sorry but you need to go back and read what I said. I did not accuse you of anything. I only repeated what I read and it does look as if you’ve lied. I’ve seen on Az Atheist’s blog the proof you’re after. I’ve also seen there how you have refused to discuss issues with Az Atheist instead relying on personal insults and refusing because of his lack of credentials. But as I said even you have said this doesn’t matter as long as someone’s argument is backed up with evidence, which is why I called you a hypocrite. I think I’ve seen all I need to. Thank you for enlightening me about Christian morality. It’s been a real eye-opener. Tommy: Please stop wasting my time, and the time of any readers, with these second-hand innuendos and accusations, about which you admit you know nothing, and which you so naively and willingly swallow. If you come back to this blog, please come back with some substance, next time. I've asked you several times now to back up your statements, or the statements you parrot from Ken, and so far you have offered nothing besides his second-hand accusations, and a few tedious and vague innuendoes that you claim to have substantiated for yourself, somehow. This is a bore. If you can't rustle up any facts, go haunt some blog that welcomes vacuities. Hi, when will your new book be out? I'll keep an eye out for it. Do you know who will be the featured authors yet? Hi, Michael. I guess you mean Faith Seeking Understanding? It should be out early in 2012. Some of the writers include Philip Yancey, Gary Habermas, Miriam Adeney, Allan Chapman (Oxford historian of science), Guillermo Gonzalez, Yuan Zhiming, Ben McFarland (a biologist), and Vishal Mangalwadi, and myself, along with interviews of Rodney Stark and Don Richardson. It's looking good, so far. Hope you enjoy it. Why Mark Driscoll is wrong about Avatar.